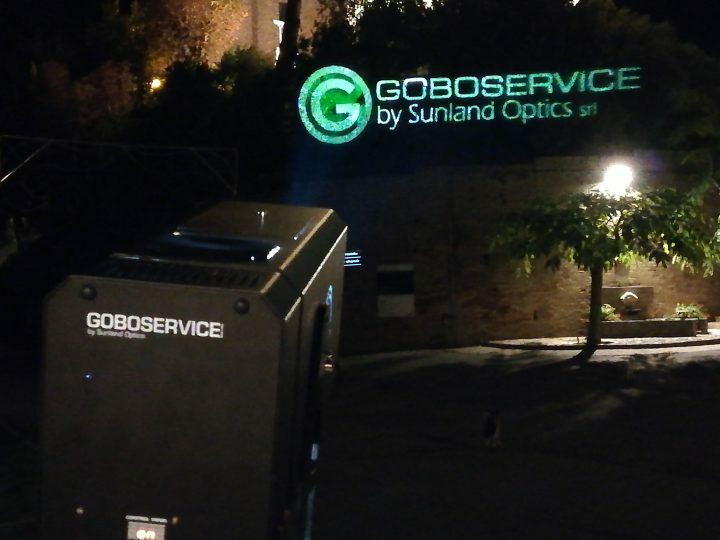 Goboservice are well-known for the design and manufacture of personalised dichroic gobos, in both glass and metal, featuring the most advanced techniques seen in the best known fixtures and lighting companies in the industry. But this is not all Goboservice has to offer, far from it. Within its catalog, the company has a series of illuminators ideal for any application, both indoor and outdoor, architectural or environmental, and today we bring to you a test of the new GOLUX 1000 in a very special and characteristic location. The GOLUX 1000 is a powerful projector with a zoom range of 7.7° to 34°, focus, aluminium casing and electronic ballast. All this allows for high extensions and long distance projections of up to 600m in distance. GOLUX is an extremely easy-to-use illuminator, rich in useful and innovative features. This starts with the focus and zoom systems on the lower side of the fixture, which allow for easy access and precision during the adjustment phase. 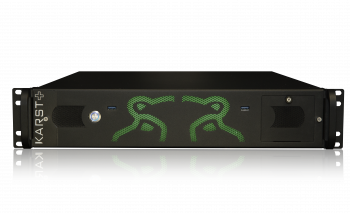 The fixture can be configured via the display on the back of the unit, and features the possibility of inserting various accessories for dynamic gobo management. 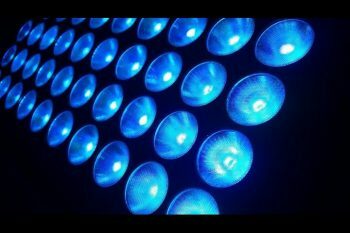 Finally, the fixture allows for remote control of gobo selection or positioning, either via DMX or directly from your smartphone or tablet, thanks to the internal Wi-Fi card. The strength of this particular product is held by the number of accessories, which give rise to an extremely dynamic and flexible illuminator. Goboservice offers an image changer kit with 5 slots, which can be controlled remotely via the app. There’s also a single gobo rotation kit, a customisable effect dynamic wheel, and a framing system to shape the gobos. Also included are the pole bracket, the extensible stand and the rain cover for outdoor applications. All the accessories are easily applied thanks to a special opening on the top of the projector, which allows the various kits to be housed quickly and safely thanks to the guides that allow for fixing on the outside of the underside. 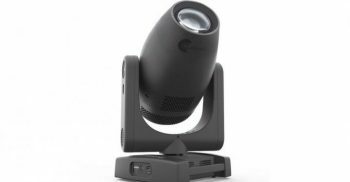 Moreover, the structure is solid and well-designed, with a tilt adjustment system equipped with a clamping mechanism on a bracket, featuring a wide support surface for optimum balance of the projector. Inside, a Philips 1000W discharge lamp, with a colour temperature of 6000K, is capable of delivering 120,000 lumens of output power. The access system to the source housing is also well thought through, positioned on the back of the projector and protected by a zip-lock block containing the electronic ballast. We tested GOLUX at Moresco, a town located in the heart of the Marche in a location known to be the smallest village in Italy and characterised by an unusual heptagonal tower. The building plays headquarters to the Visual Arts Center Tomav, within which there is currently an exhibition on Maurizio Cesarini. The test was achieved by placing the projector roughly 50 metres from the base of the tower, projecting onto a surface roughly 30 metres in height. This gave a diagonal projection distance of around 65 metres. 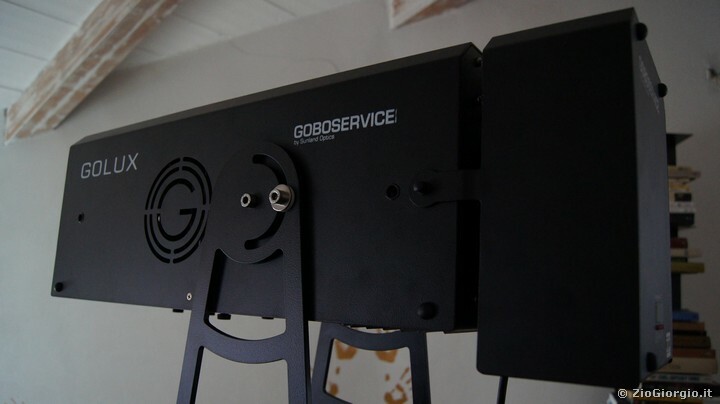 Goboservice specially 5 different gobos for the test, each relating to the test. These included the the logos of the municipality of Moresco and of the Tomav museum, the image of one of the works exhibited, and the logos of both Goboservice and LightSoundJournal. 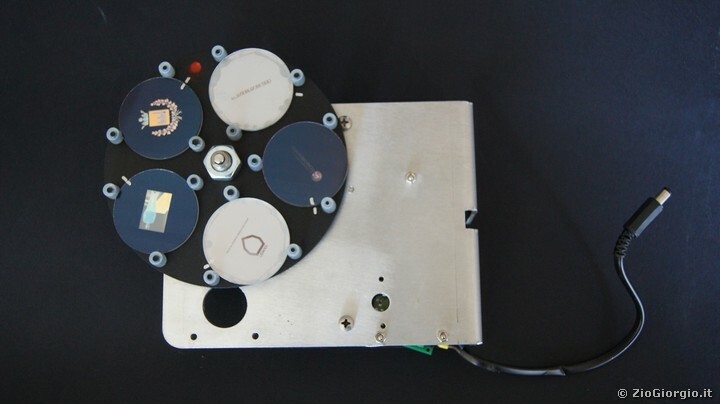 After placing the projector on the stand provided by the company, we inserted the five reproductions within the supplied gobo changer kit, switched on the projector and configured the wireless connection to control the fixture from our smartphone. The gobos housed inside differed from one another due to both their complexity of style and the amount of colours present. Despite this, the very precise and slim focus depth, combined the wide zoom range, allowed us to carefully adjust the projected image. This would make the feature undoubtedly capable when working with both a range of projection distances and surfaces areas. The result, also visible from the photos, was very satisfying. Colors are present and well reproduced, and the contours well defined even with the zoom fully open. We also experimented with projecting on the front of the trees placed at the base of the tower, and still achieved good definition, with an original and unexpected artistic effect. The app, available for iOS and Android, also lets you create multiple scenes where you can select the sequence and projection time of each gobo, manually choose what to project, set the DMX address, read diagnostics, and more. Here we have a simple fixture, but one rich in accessories and “up with the times” features such as wireless connectivity and gobo shaping and automation systems. These make the fixture excellently suited to both temporary and fixed installations or, why not, in the field of entertainment. The tower of Moresco, on which we performed the various tests, also gave us a unique opportunity to closely and comprehensively observe the various features of this product. 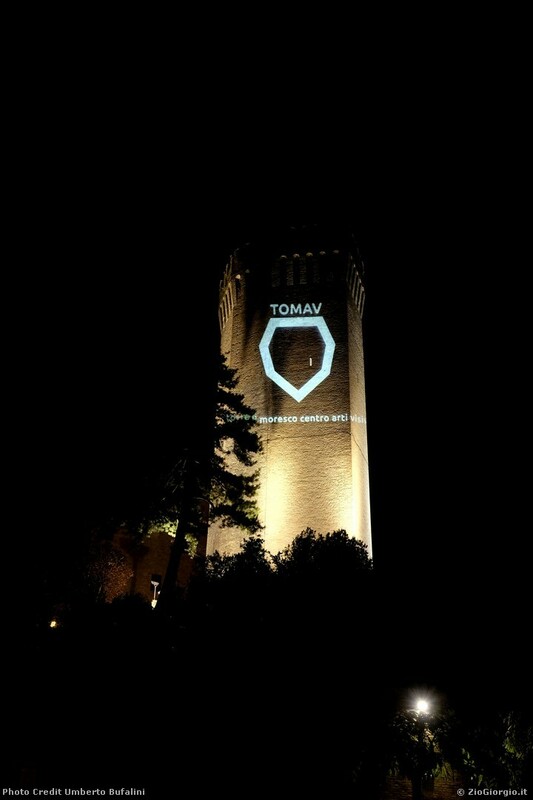 This experience was made possible thanks to the support of the City of Moresco, Andrea Giusti – Artistic Director of Tomav, and the contribution of the well-known artist Maurizio Cesarini who kindly granted us permission to project one of his works.